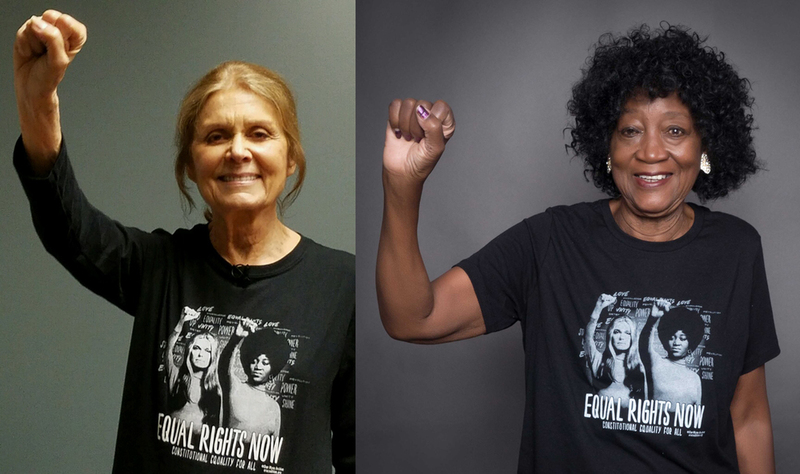 Gloria Steinem and Dorothy Pitman Hughes were among the most prominent leaders of the fight for the Equal Rights Amendment. In 1971 they posed for the photo that would become an icon of the women's empowerment movement. Starting in 1923 the Equal Rights Amendment guaranteeing equality under the constitution for women and girls was introduced in every session of Congress. In 1972 it finally passed the House and the Senate but was not ratified by the required number of states to become a constitutional amendment. By the 1982 deadline it fell just three states short of ratification and did NOT become the law of the land. Today the fight for equal rights continues. Gloria and Dorothy haven’t stopped fighting for the Equal Rights Amendment. It's time to join them and the ERA Coalition. Constitutional equality for all isn't a dream—it's a right. I stand for #EqualRightsNow with Gloria Steinem and Dorothy Pitman Hughes. Support the ERA Coalition and help get full constitutional equality for women and girls by purchasing this limited edition tee at represent.com/equalrights (link to buy in bio). Dr Scully says... #EqualRightsNow. Link in bio. Have we not learned anything from history? We must stand up to hate before it leads our country down a road we will all be ashamed of.